Anxiety. A word that is hardly spoken about, but yet impacts so many of us on a daily basis; including myself. So it was no surprise, when I started noticing Finlee (my 6 year old) getting anxious in different situations at such an early age. Childhood anxiety is real and I feel it’s important for families to be aware of what anxiety looks like in children, when to be concerned about anxiety in children and how you can help your child if they have anxiety. Anxiety is a normal emotion for children and is an essential part of their childhood development. Anxiety helps children to learn about their world around them by alerting them to threats, protecting them from danger and helping them to reach important goals. Beyond Blue estimate that 1 in 6 Australian children (this is equivalent to 440,000 children in the last 12 months) experience anxiety more intensely in different areas of their life, which then stops them from reaching their full potential and enjoying life to its fullest. All children will feel anxious from time to time (first day of school, a big exam), but it’s when the anxious feelings don’t subside, are ongoing and exist without any particular reason when anxiety starts to become a problem. Remember early intervention is key in order to try and reduce the anxiety from impacting on their life now, but also by giving them coping skills and strategies that they can use to minimise long term anxiety in adulthood. As parents we are one of the primary supports our children have and a result we play an important role when working through their childhood anxiety. Encourage your child to face his/her fears, not run away from them. Tell your child that it is ok to be imperfect. Model self-care and positive thinking. Reward your child’s brave behaviours. Encourage a good sleep hygiene. Encourage your child to express his/her anxiety. Help your child to problem solve. Practice relaxation exercises with your child. As I mentioned earlier on, Finlee my little one struggles with anxiety. I work with him daily and encourage him to talk about his anxiety, explore what his brain is thinking etc. Remember it’s better to have their feelings out in the open then floating around in their little brain and so hard for them to comprehend what it means, what to do etc. There are many different products on the market for anxiety, but the one that has rocked Finlee’s world is the little wuppy® worry puppy. 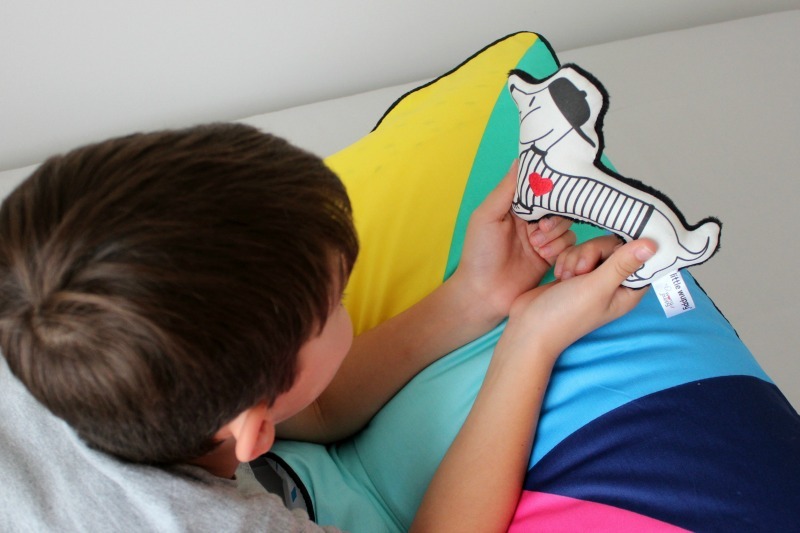 This amazing worry puppy is designed to help ease children’s worries and to comfort them. It’s simple. Children can talk to their worry puppy about any of their worries. 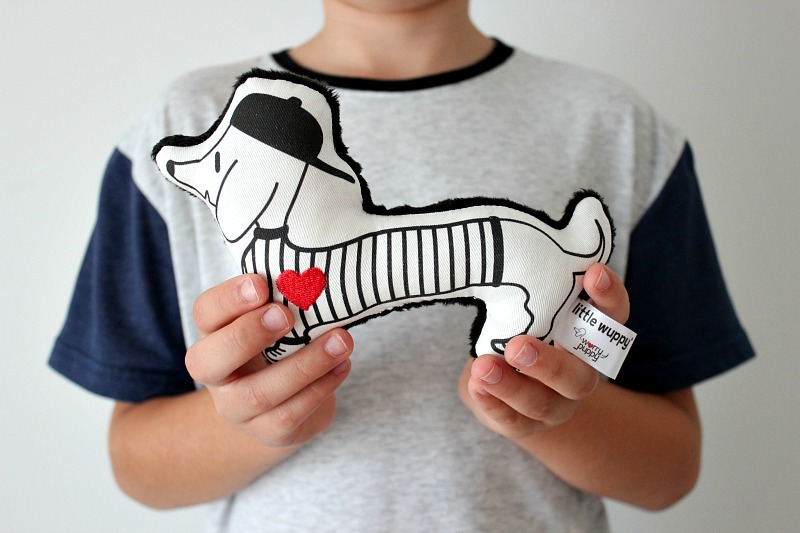 The special feature of the little wuppy® is its red heart. When placed against a child’s heart, the child can send their worries to the puppy so they don’t need to worry about it anymore. Finlee uses his little wuppy® daily and my husband and I have seen first hand how powerful this simple designed therapy toy has helped Finlee. Being a parent is not easy, but being a parent with a child with anxiety can be slightly tricky at times. You may feel drained, frustrated with systems etc, but please remember you’re doing a great job. Does your little one have anxiety? Comment below with any suggestions you can give other parents. Angela Henderson is an author, entrepreneur, blogger, mental health clinician and most importantly a mother. She explores various topics related to parenting/children on her blog and also in her two books 30 Days, 30 Ways for Connecting with Your Child and Healthy Snack Ideas for Kids. Connect with her on Facebook, Instagram and her website Finlee and Me.